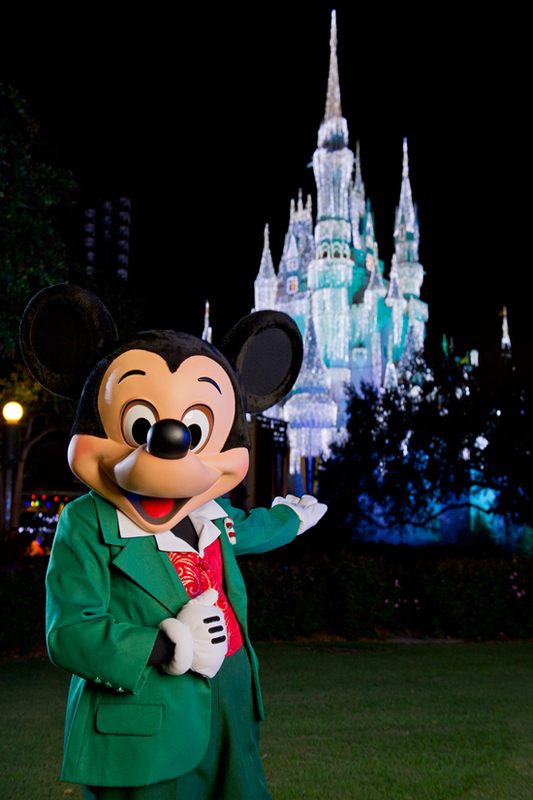 Beginning on select nights in the early part of November and continuing through December 18th, 2015, Disney World offers a separate-ticketed Christmas party at the Magic Kingdom called Mickey’s Very Merry Christmas Party. With fireworks, stage shows, parades, holiday character dance parties, complimentary hot cocoa and cookies, and snow, Mickey Mouse and his friends bring the Christmas season alive with holiday caroling and greetings. This is our guide to Mickey’s Very Merry Christmas Party. Mickey’s Very Merry Christmas Party is a separate event held outside of normal park hours that officially gets started at 7 pm but guests attending the event can start entering the park at 4 pm. In addition to all of the Christmas shows and parades, many of the parks major attractions are open with shorter lines than a typical day at the park. The main highlights of the party are the parade that is held at 8:15 pm and 10:30 pm that features the classic Disney Characters along with the gingerbread men and toy soldiers that you can find out about here, the Nutcracker-inspired Celebrate the Season character caroling stage show in front of Cinderella Castle at 7:45 pm, 10:05 pm, and 11:20 pm that you can find out about here, and the Holiday Wishes fireworks show at 9:30 pm that synchronizes fireworks behind Cinderella Castle to familiar Christmas songs with special lighting effects displayed on the castle that you can find out about here. A Christmas mini-show not to be missed that can be seen my both normal visitors to the park and early arrivals to the Christmas Party is the lighting ceremony of the Castle Lights at 6:15 pm and 8 pm that features over 200,000 sparkling lights that you can find out about here that features Anna, Elsa, and Olaf from Disney’s Frozen. Another show over in Tomorrowland is called A Totally Tomorrowland Christmas that features Buzz Lightyear, Stitch, and characters from Monster’s Inc. that is held at 7:45 pm, 8:45 pm, 9:55 pm, 10:50 pm, 11:45 pm. In addition to all of the holiday decorations around the Magic Kingdom Park, Disney helps to immerse yourself into the Holiday Season with Florida’s version of snow on Main Street USA throughout the night with complimentary hot cocoa and cookies at several restaurants all throughout the park. There are also a lot of options of interactions with Disney characters throughout the park with meet and greats and character dance parties including Woody’s Hootin’ Holiday Open House at The Diamond Horseshoe in Libery Square and Club Tinsel at Cosmic Ray’s Starlight Cafe in Tomorrowland. During Mickey’s Christmas Party, some of the biggest attractions at the Magic Kingdom are open with much shorter lines than on a typical day at the park including Space Mountain, Splash Mountain, Big Thunder Mountain Railroad, and The Haunted Mansion. Pricing for the event is on a scale with many of the weekday prices a little bit cheaper than the events held on Fridays and on the final two nights of the event and also depending on whether the tickets are purchased in advance or at the gate. Mickey’s Christmas Party will have many nights that sell out so it is advantageous to purchase your tickets once you have your dates lined up. Click here to see all of the prices from the official website. Click here to read our guide on spending the Christmas Holiday at Disney World and click here for all of the Christmas events going on around Orlando. This entry was posted in Attractions and tagged annual events, christmas, december, disney world, holidays, magic kingdom, new years eve, november, thanksgiving. Bookmark the permalink.